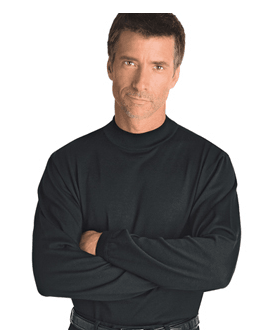 If you want one of those iconic black mock turtlenecks made popular by Apple co-founder Steve Jobs, you may have to wait a couple months. Following Jobs’ death October 5, St. Croix Collections, maker of the mockneck, reported that it has sold out of the black version Jobs wore. Retailing at $175, the company has decided to donate $20 of every turtleneck sold to the American Cancer Society in honor of Jobs and his battle with pancreatic cancer. Sales doubled overnight following his death and many retail stores have run out of them. Because the made-in-U.S. machine washable togs are made-to-order, St. Croix stores won’t be able to get any more for another season – hence the waiting time of about two months. Bernhard Brenner the founder of St. Croix parent company Knitcraft Corp, told the Business Journal that Jobs usually bought several dozen of the cotton/microfiber blend black turtlenecks a year and occasionally called to tell Brenner how much he liked them.